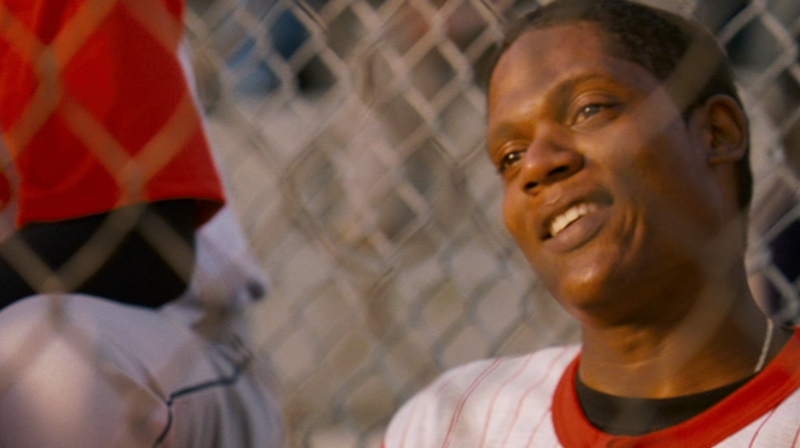 “Sugar”, Anna Boden and Ryan Fleck’s 2008 cinematic jewel, is a one of a kind baseball movie, a character study wrapped in an immigrant’s tale encased in a baseball movie. It opens at a Dominican Republic baseball academy where the titular character, Miguel “Sugar” Santos (Algenis Perez Soto), a pitcher, is groomed along with a whole heap of other players to be shipped off to the United States to infiltrate all manner of baseball organizations and their farm leagues to perhaps, one day, make it to the big leagues. 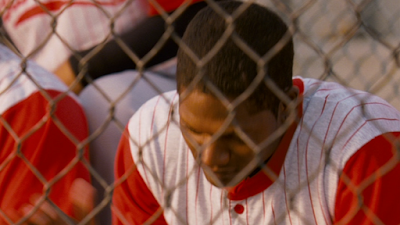 Though the life can be wearying, epitomized in their daily English lessons which comprise simply of repeating baseball terms over and over (“foul ball!”), there are little stolen moments, like Miguel cradling a baseball in the manner of the new pitch he has just learned, betraying the sweetness too. Eventually Miguel will get sent to America, and before he does the film takes time to linger on Miguel in his community, with his family and friends, where in a few brief flourishes Boden and Fleck evince what foreign riches can promise but also the possibility that such a promise can come up empty. 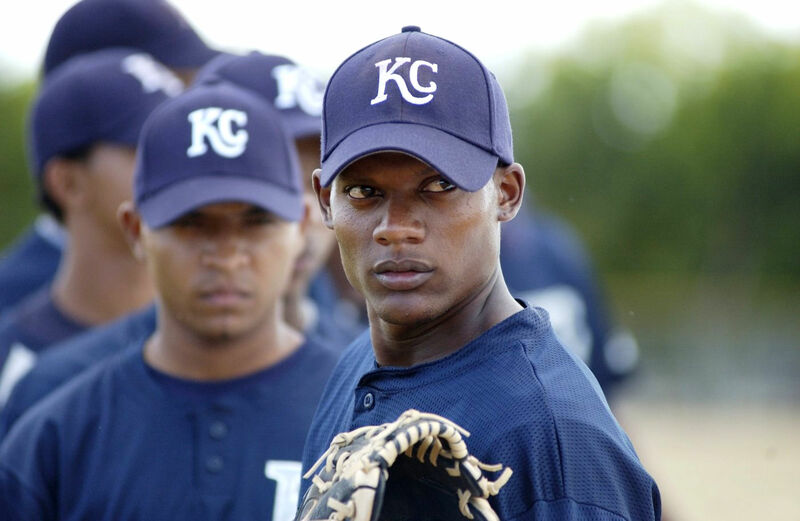 In a scene near the ocean, Miguel jokingly picks on a friend, a former baseball prospect that flamed out. The friend laughs, at first, but his smile slowly wipes away, the sorrow of what could have been washing over him, and when Miguel sees this reaction his grin goes too, suddenly coming face to face with what could be. In the States, first at spring training in Arizona and then at Single A ball in Iowa, where despite the warmth exuded by the elderly couple that gives him room and board, the message quickly becomes clear – play ball, be good, get great or you go home. We see this cut both ways, in the form of Jorge (Rayniel Rufio), the faux-vet and Miguel’s friend who doesn’t make the grade and gets cut, and the American Brad (Andre Holland) who exudes good cheer and serious talent and gets called up to the next level. Tucked within all of this, however, is the life of someone in a different land struggling to adjust, particularly as his fellow countrymen break apart. Early Miguel visits a small diner where, knowing little English, he can’t place a simple order for eggs. In a beautiful little moment, the waitress (Marla Finn) reaches out by presenting him a plate of different kinds of egg, over-easy, scrambled, sunny side up, explaining each one. “Thank you,” he says. “You’re welcome,” she says, and Finn fills that reply with so much modest goodwill it makes your head spin. Too often though those sorts of gestures are lacking, particularly within the structure of the team itself, where winning and performing are paramount, where the team’s manager (Johnny Marx) says he knows what Miguel is going through even though he only knows what Miguel is going through on the mound, not outside the clubhouse, suggesting the role of coach as a Leader of Men has its limits. On the diamond, Miguel’s once promising skills, rendered in montages that are the film’s principal concessions to convention, erode, on account of both injury and life emotion. His encroaching detachment, with the game, with the team, is notably evoked in a lengthy tracking shot that follows Miguel through a hotel where his team is staying, from his room and down the hallway and through a bar and an arcade and to a bowling alley where the couple teammates are otherwise engaged, leading him to turn and walk away, alone, this sterile environment of manufactured noise and artificial lighting portrayed in painful contrast to Miguel’s native country of wind and light and surf and the friendly noises of family and friends. From here, “Sugar” takes a turn that makes so many cinematic climaxes seem pat and wretchedly conventional in comparison. The movie ends on a baseball diamond, yes, but it is not a reckoning. The reckoning happens off the baseball field as Miguel leaves the team and Iowa for New York, in search of Jorge, for some sort of New Start that he would likely struggle to explain. Instead he winds up stranded in a seedy motel he can barely afford before briefly winding up on the street until he befriends a Chilean carpenter named Osvaldo (Jaime Tirelli) who opens up his home. With this friendship, with the eventual re-introduction of Jorge, with a job Miguel gets at a small restaurant, with the waitress (Alina Vargas) at the restaurant who takes a liking to him, a support system emerges and a new community, not unlike the one back home but still different, helps give him solid footing. He winds up back on a mound in a Bronx park where a gaggle of ex-minor leaguers to play just for fun. You see that in Miguel’s cocksure grin, reminiscent of the one he sported at the film’s start, but colored now with a little more harmlessness, less competitiveness. A purer elicitation of For Love of the Game, reader, you will not find. Through all this, Miguel re-gains his sense of self, emblemized in the wonderful moment when he, along with a few of the other players at their little park in the Bronx, proudly list their names for the benefit of the camera, a breaking of the fourth wall that this otherwise logical movie earns with its uncompromising earnestness. 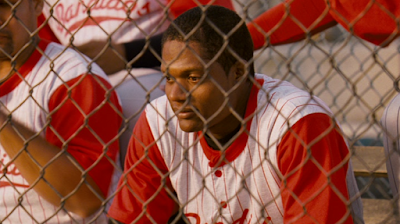 And after that, “Sugar” is kind enough to give its protagonist a moment to himself, where Miguel sits on the bench, briefly conversing with his teammates and then…looking away, contemplating. It deliberately evokes the earlier moment back home with Miguel’s friend who flamed out at his chance playing baseball in America. Then, he erupts into a fit of clapping. He leans back and smiles, content. He’ll be okay.